When Rina and I first started this blog, one of our early debates was regarding the most superior potato style. I mean, what an an impossible question, right? Think of the wonderful forms potatoes take - crispy french fries, greasy hash browns, sweet potato casserole topped with marshmallows, salty chips. While I have yet to meet a potato I don't like, I find that versatility is key and a lot of these potato styles (i.e. sweet potato casserole) don't really go with everything. Enter this recipe. I was playing around in the kitchen after getting a ginormous bag of potatoes in my weekly CSA (if you're not already a part of one and are looking for fresh, local produce, I highly recommend you look into a CSA. More info here). I needed a potato style that could last me many meals over multiple days. I also had some dried sage from a past CSA, so I quickly doctored up a new kind of roasted potato - a cross between home fries, roasted potato wedges and parmesan truffle fries (ish). Honestly, you can't go wrong with these potatoes. They are so easy to make, super cheap and make you look like the fancy-pants chef you know you secretly are (even if your egg-frying skills aren't quite up to snuff, see photos for evidence). The beautiful thing about these potatoes is that they go just as well with eggs over easy as they do with a piece of fish. Load them with cheese, guac and some pico de gallo and you've got yourself potato nachos. Add them to a roasted veggie salad - delish! Really, the options are endless. Natures most agreeable vegetable (yes, potatoes are vegetables) to the rescue! Preheat the oven to 425. 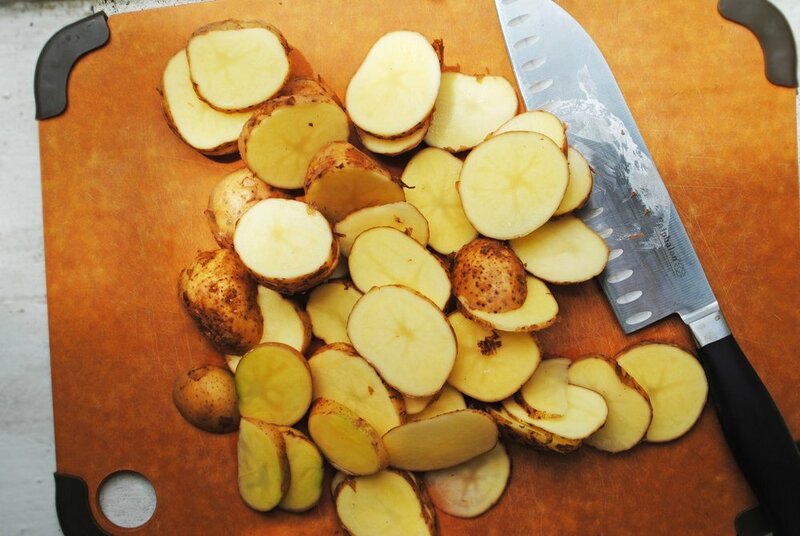 Meanwhile, slice the potatoes into thin, round discs. The thinner you make the potatoes, the crispier they will be. Grease the pan with 1 tbs of olive oil. Then arrange the potatoes on a pan. Sprinkle with sage, salt, pepper and red pepper flakes. Drizzle potatoes with rest of the olive oil. Toss to coat and rearrange, minimizing overlapping as much as possible. Bake for 25-30 minutes, tossing about halfway through. This is one of those "know your oven" moments. For example, mine gets especially hot in the back, so I make sure to rotate halfway through. Remove from oven. If using, add parmesan while the potatoes are still hot. To store. These potatoes last well in the fridge for a few days.